Adelbert Ames (1835-1933), Col. 20th Maine Infantry, Brig. General & Bvt. Major General USA (ME). 1st Bull Run (M.O.H. ), Peninsula campaign, Malvern Hill, Antietam, Fredericksburg, Chancellorsville, Gettysburg, Virginia Overland campaign, Petersburg, Fort Fisher, NC., Reconstruction Governor of Mississippi. Last general officer of either side to die. 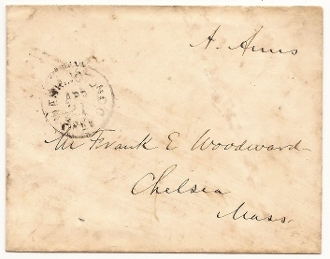 Franked postally used envelope "A.Ames" to MA as Member of Congress. Fine. Medal of Honor (MOH) recipient.